The Slovak-Hungarian Gas Interconnector (SK-HU Interconnector) is a 113km-long gas pipeline traversing the territories of Slovakia and Hungary. Construction of the pipeline was completed in March 2014 and commercial operations began in July 2015. The two-way gas pipeline stretches 94km into Hungarian territory and 19km in Slovak territory. Its annual transmission capacity is approximately 4.5 billion cubic metres, of which the capacity in the Slovak-Hungarian direction is approximately 500,000m³ an hour, and that in the Hungarian-Slovak direction is approximately 200,000m³ an hour. Eustream and Hungarian Gas Transit signed the joint investment agreement in May 2012. The Hungarian gas transit was established in January 2012 as a result of secession from the MVM OVIT National Power Line Company with the purpose of implementing the project. MVM Hungarian Electricity and MFB Invest own an equal share in the company. The first steel pipes for the project were delivered in December 2012 and the pipeline construction started in March 2013. The Ahuroa underground gas storage (AGS) facility is located in Taranaki, New Zealand. Opened in May 2011, it is the first such facility to be developed in the country. It has an extraction capacity of 45 terajoules a day (TJ/d). The pipeline forms part of the larger North-South gas corridor and enables Slovakia to access European gas projects such as the South Stream and the proposed Adria LNG terminal (Krk LNG terminal) in Croatia. It provides access to the Western-European gas networks for Hungary, energy security for Europe, and diversity to its gas supply routes. Out of the overall Hungarian gas import capacity provided by pipelines, the new pipeline accounts for approximately 10% to 15%. More than €160m (approximately $199m) was earmarked for the project, of which €21m (approximately $26m) were spent for the Slovak section’s development. The European Investment Bank (EIB) supported the plan by providing €30m (approximately $37m) under its European Energy Programme for Recovery (EEPR). The EEPR is a €4bn programme, set up in 2009, to support projects aimed at making energy supplies more reliable. It also hoped to boost Europe’s economic recovery and help reduce greenhouse emissions. As of October 2014, 59 projects benefited from the programme. The SK-HU Interconnector has joined the high-pressure system, located at Velké Zlievce in Slovakia, with the Hungarian transmission network, near the village of Vecsés in the suburbs of Budapest. The connecting point of the two national sections is the Ipoly River. A horizontal directional drilling method was used to lay the pipeline under the river. "The two-way gas pipeline stretches for 94km in the Hungarian territory and 19km in the Slovak territory. Its annual transmission capacity is approximately 4.5 billion cubic metres." The pipeline crosses 38 routes, including a motorway, six expressways, eight railway tracks and five rivers. It traverses nine Slovakian municipalities, namely Velké Zlievce, Malé Zlievce, Olováry, Glabušovce, Zombor, Kiarov, Želovce, Záhorce and Slovenské Darmoty. The Hungarian section starts from Vecsés and culminates in Balassagyarmat. A total of 1,507 steel pipes were utilised for the project. The pipes are 800mm in diameter, and between 17m and 18m-long. The project also involved the construction of the Szada compressor station, a new metering location and block valve stations. 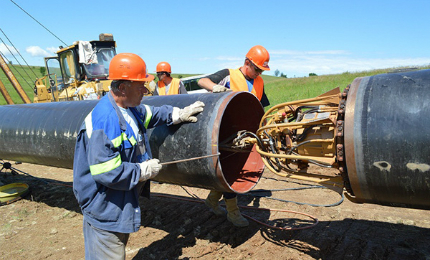 Three depot sites were constructed at Balassagyarmat, Romhány and Érsekvadkert to support the pipelaying activities. The Hungarian section of the pipeline was installed by OTF General Contractor, while the Slovak section was constructed by BMS Bojnansky. Pipeline materials were supplied by ThyssenKrupp Mannex, GASPIPE, Metinvest International and RMA Kehl.